Heads up: Mother’s day is right around the corner (it’s just 2 weeks away). What a perfect excuse for my card making obsession! 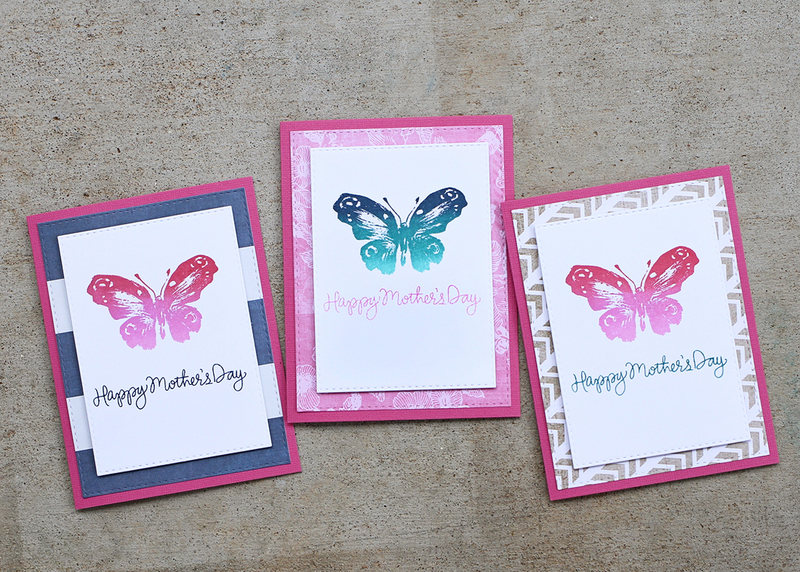 Today, I’m sharing easy Mother’s day cards using my new favorite inks by hero arts: ombre inks. Here’s what I created, with a close-up of each card. 1. Using the second biggest Simon Says Stamp stitched rectangle die, I die cut Neenah white card stock 3 times. 3. 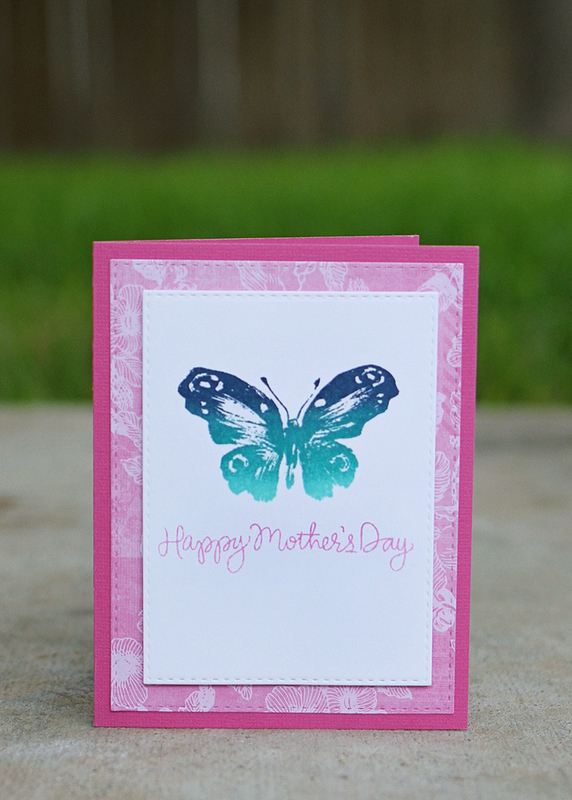 I then stamped the “Happy Mother’s Day” sentiment from the Simon Says Stamp Best Mom Ever clear stamp set below the butterfly using the same ombre ink pads. 4. 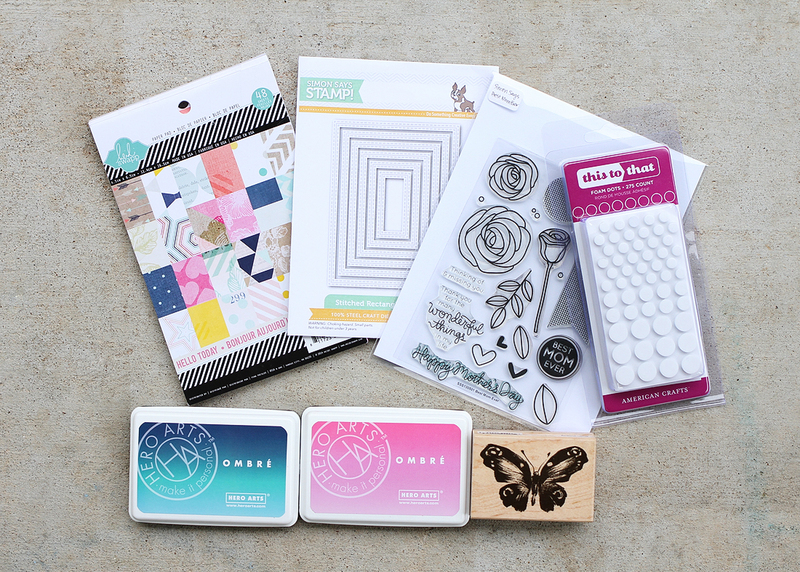 I chose 3 patterned papers from my favorite Heidi Swapp paper pad, and die cut using the largest Simon Says Stamp stitched rectangle die. 5. 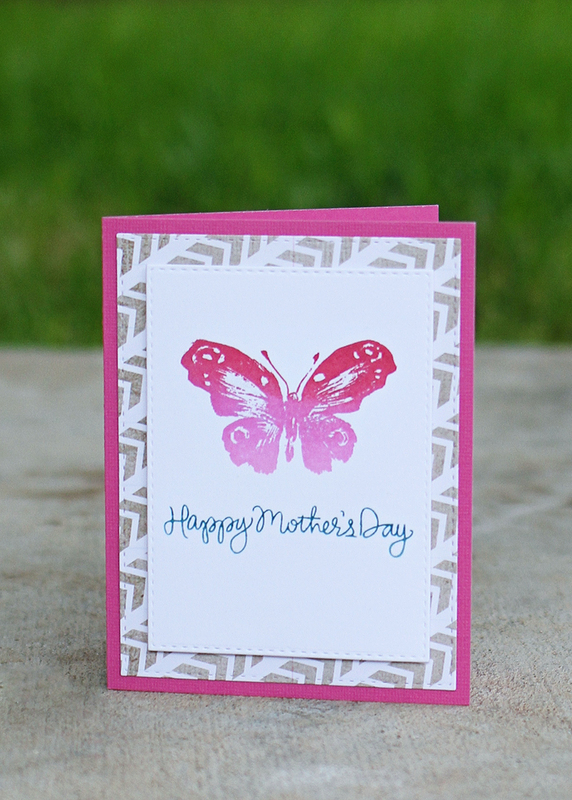 I attached the patterned paper rectangles to a hot pink card base. 6. Using American Crafts pop up foam dots, I attached the stamped white card stock on top of the patterned paper. I loved how these turned out, and how simple it was to put together. Using the ombre inks really made a difference in how the butterfly turned out. I think it looks much better than had I used a single colored ink. Can I just say that the quality of these ink pads are amazing? They are my first Hero Arts ink pads, and I love them! Also, I love how the “stitches” in the Simon Says Stamp stitched rectangle dies add just that extra something something. 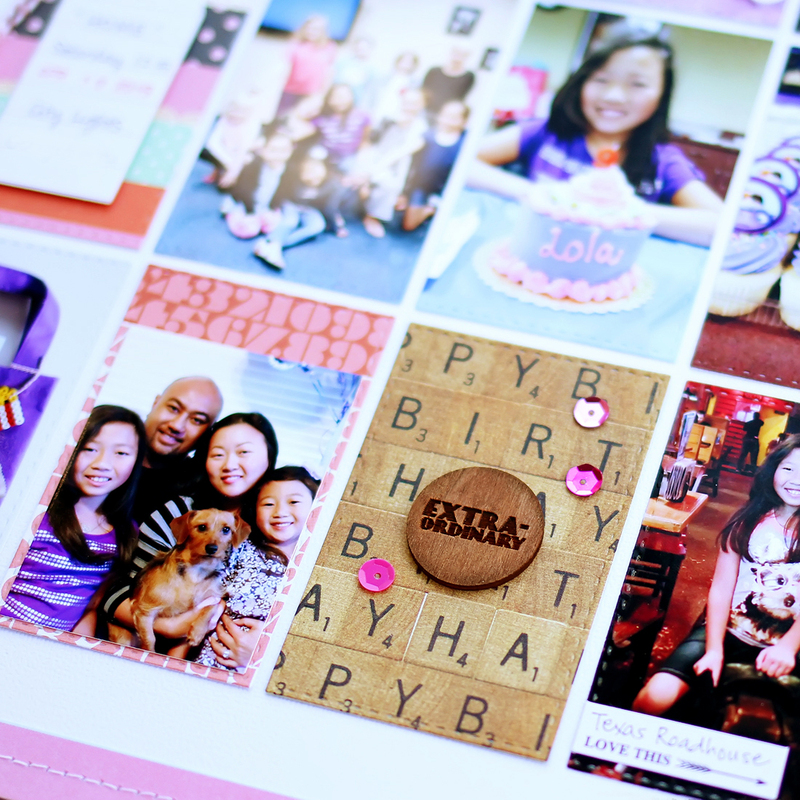 DIY birthday…& a birthday layout…& a birthday shaker card too! My oldest girl just turned 9, and we had a little celebration weekend for her. She’s growing up, and she’s at that transitional age, where chuck-e-cheese and bouncy house parties just aren’t that appealing to her. She has been wanting to watch the movie “Home,” and asked if she could invite a few girlfriends to watch it with us for her birthday. We also celebrated her birthday with family on Sunday. 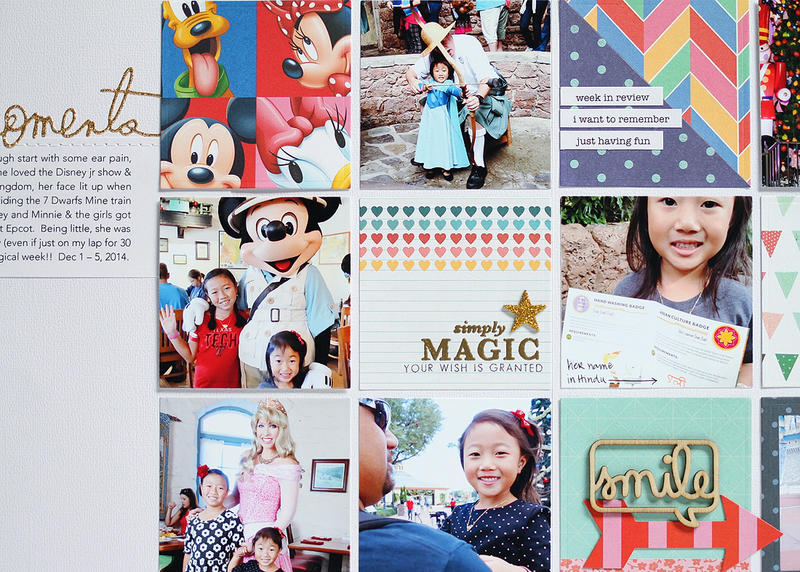 Here is a layout I did of her weekend celebration! 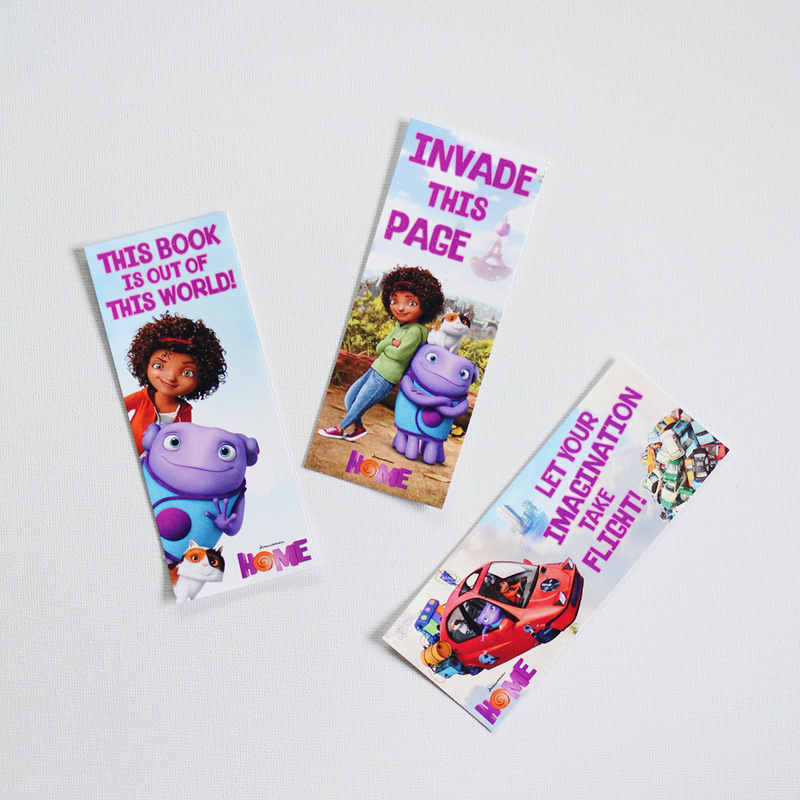 Since “Home” is such a new movie, we couldn’t find any decorations, either in stores or online. 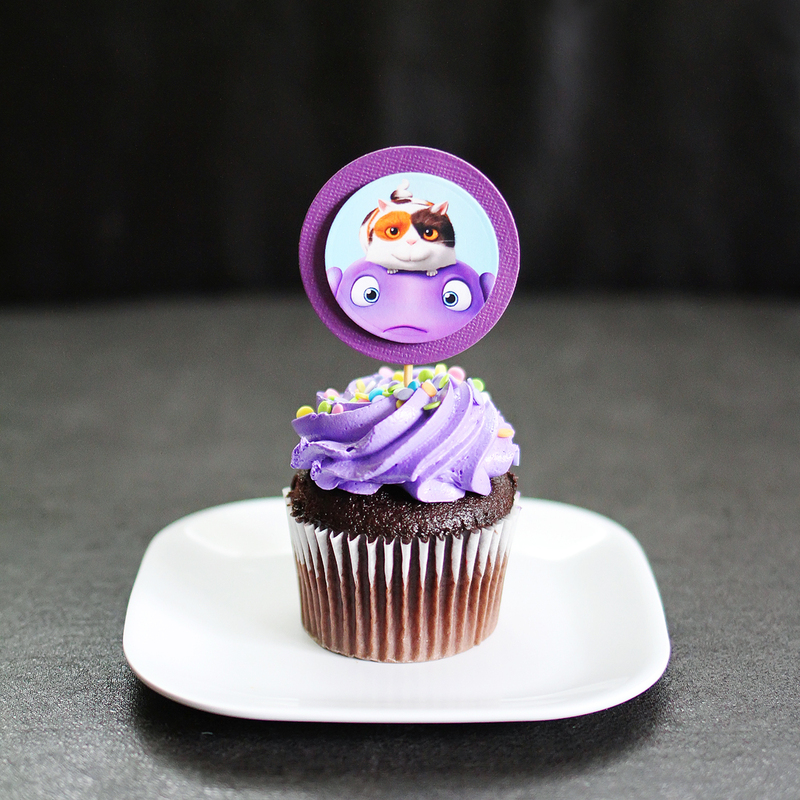 At the very least, I wanted some cupcake toppers and maybe something to go in the gift bag. 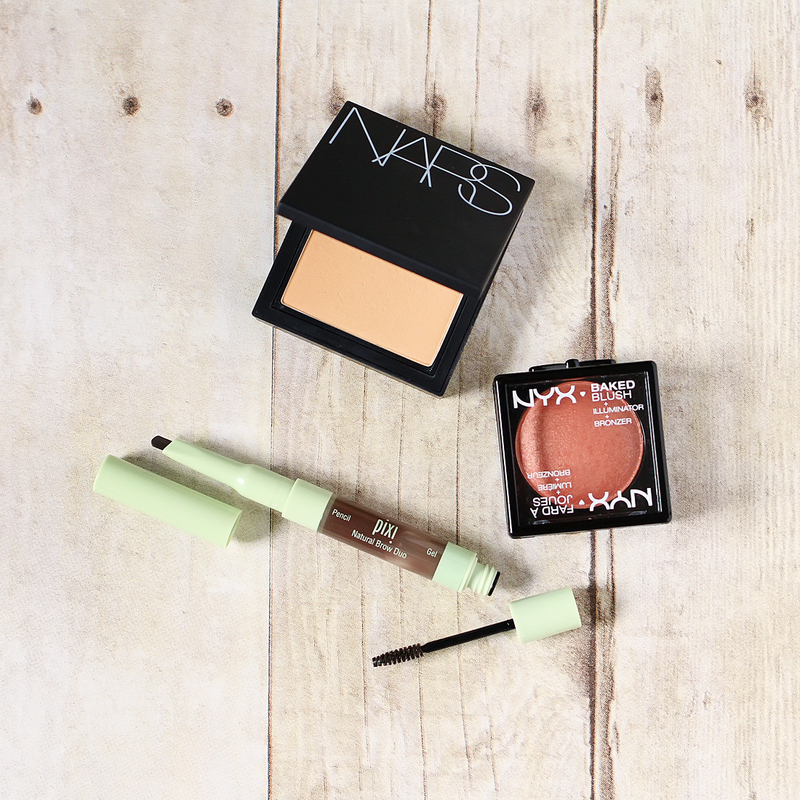 DIY to the rescue. 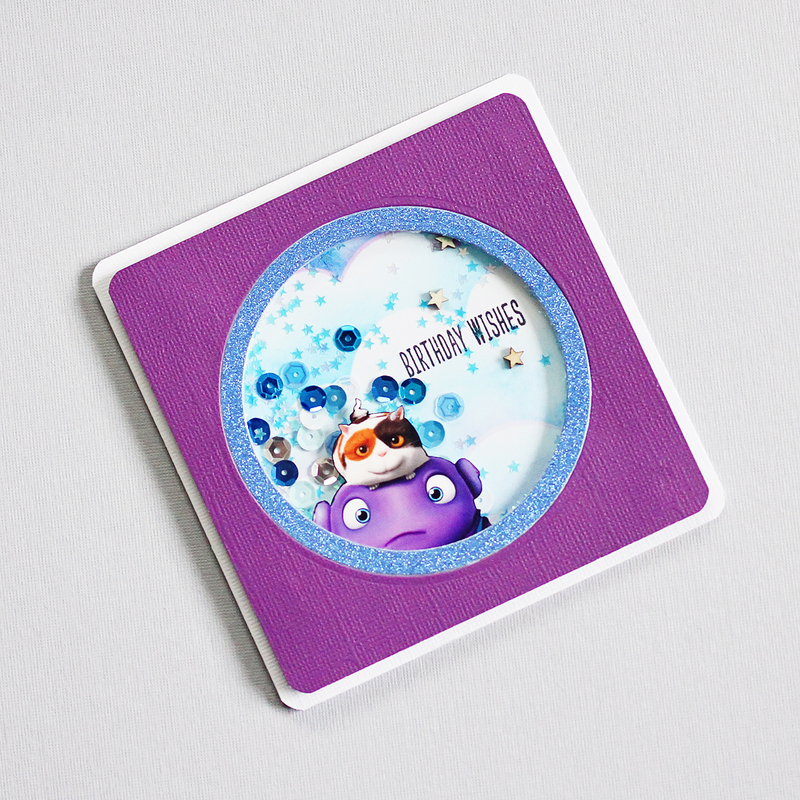 Here’s an awesome tip: If you’re having a movie-themed party, go to the movie’s website (in this case, Dreamworks), and there will most likely be printables & downloads available to you. 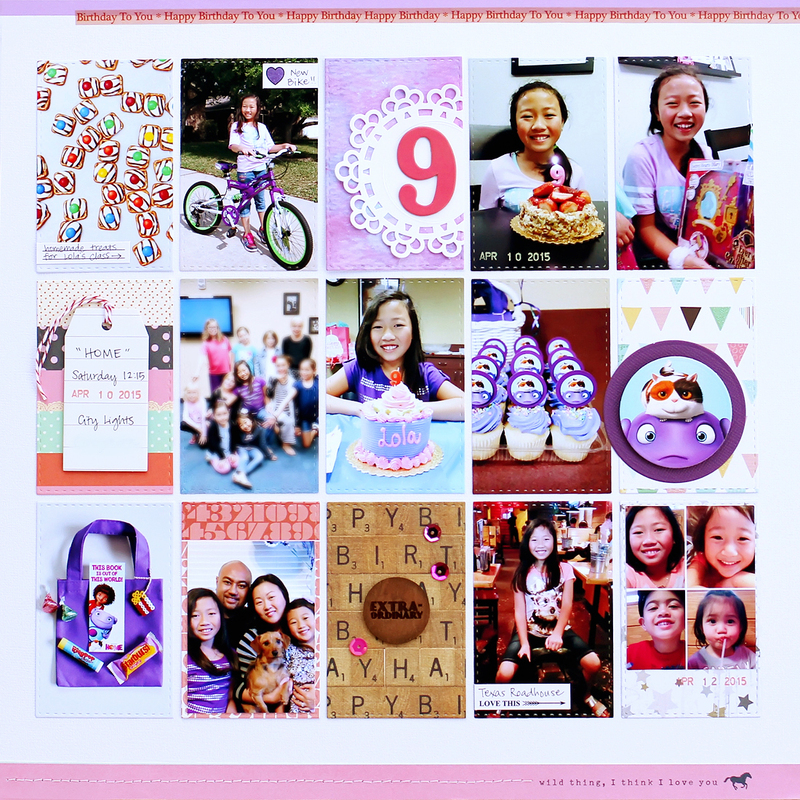 For the cupcake toppers, I put together a page in photoshop with the image I wanted repeated on the entire page, and printed it on matte presentation paper. Then I got my die-cutting tool out, and die cut the image using a circle die. (I think sticker paper would be great, but I just used what I had on hand.) 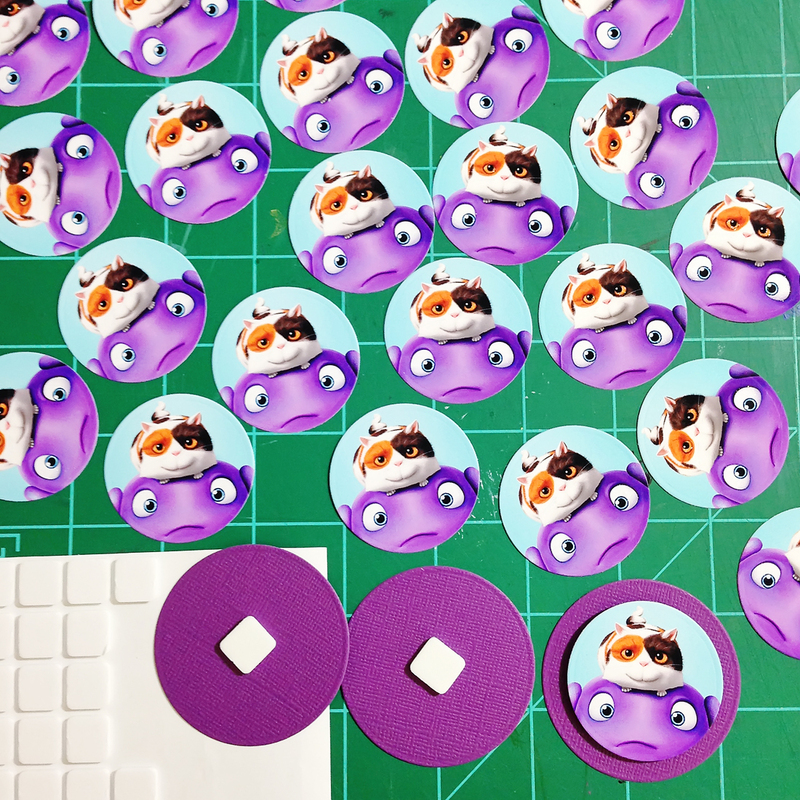 I also got some purple card stock and cut more circles using a slightly bigger circle die. 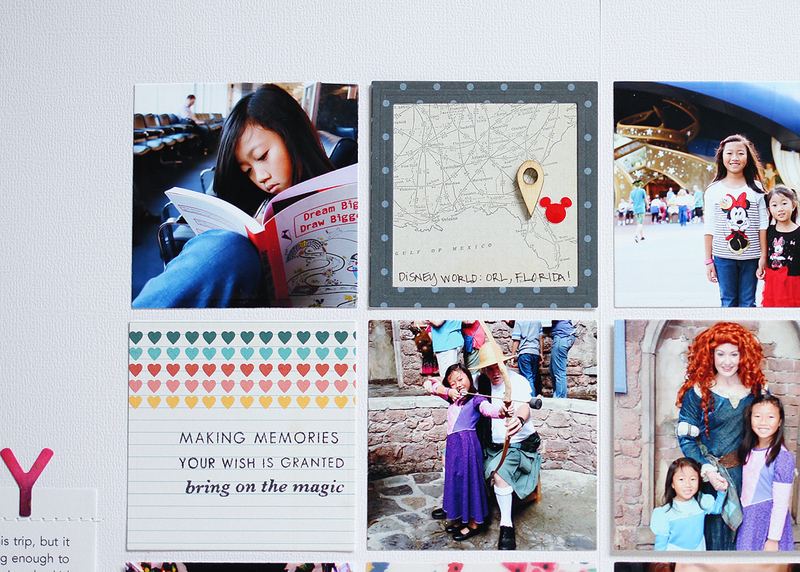 I attached the image onto card stock using foam adhesive. To put the cupcake topper together, I hot glued 2 of the finished circles back to back onto bamboo skewers/ long toothpicks. For the gift bags, I printed some book marks that I found on the website (perfect since my daughter loves to read) on matte presentation paper. 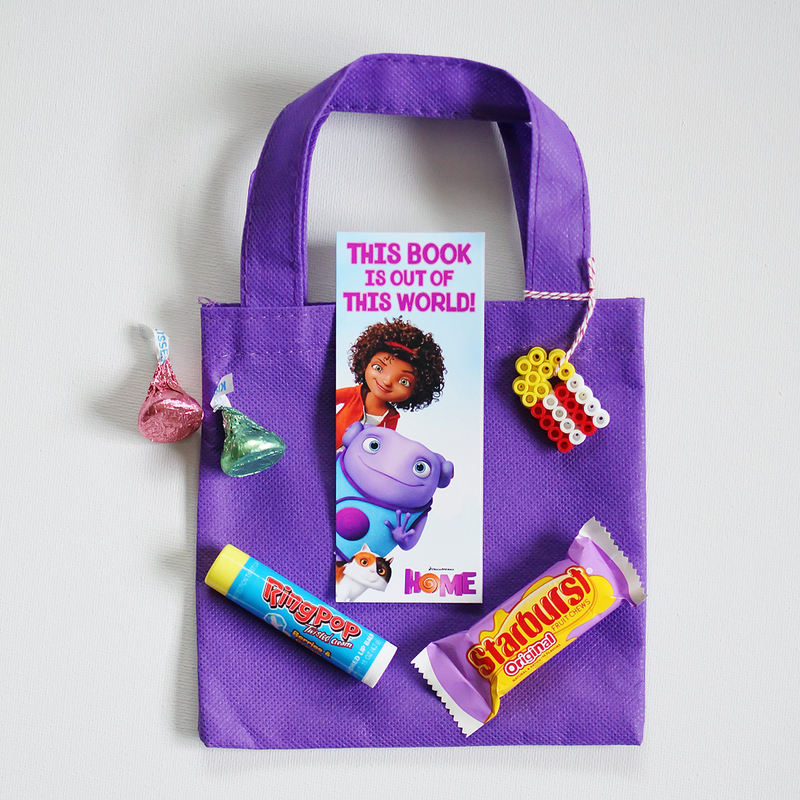 I cut out the bookmarks and used a little wink of stella glitter pen to add a little “something something.” My daughter also got into the DIY spirit by making popcorn bucket charms out of perler beads. 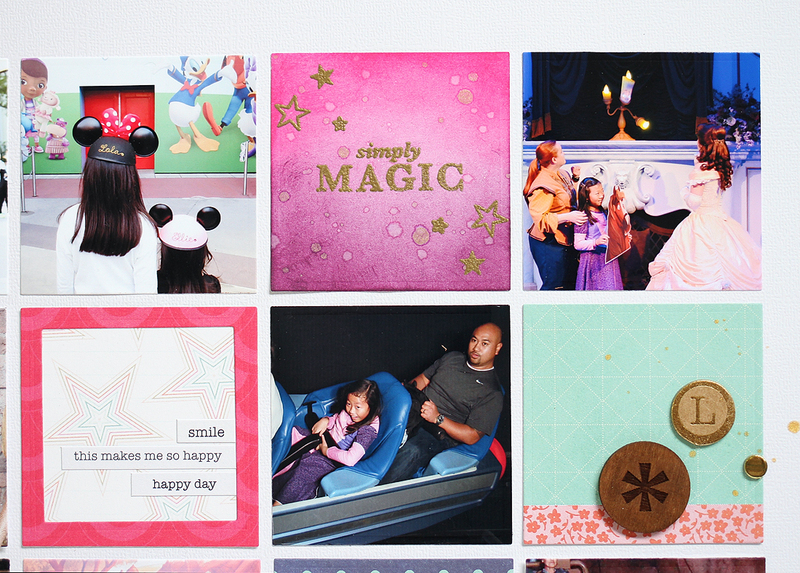 …And since I’ve been card making obsessed, I made a “Home” shaker card for her birthday. My daughter loved every thing, and I was more that happy to get a little creative for her birthday. Let me know if you have any questions! The stamp/ card making obsession continues! 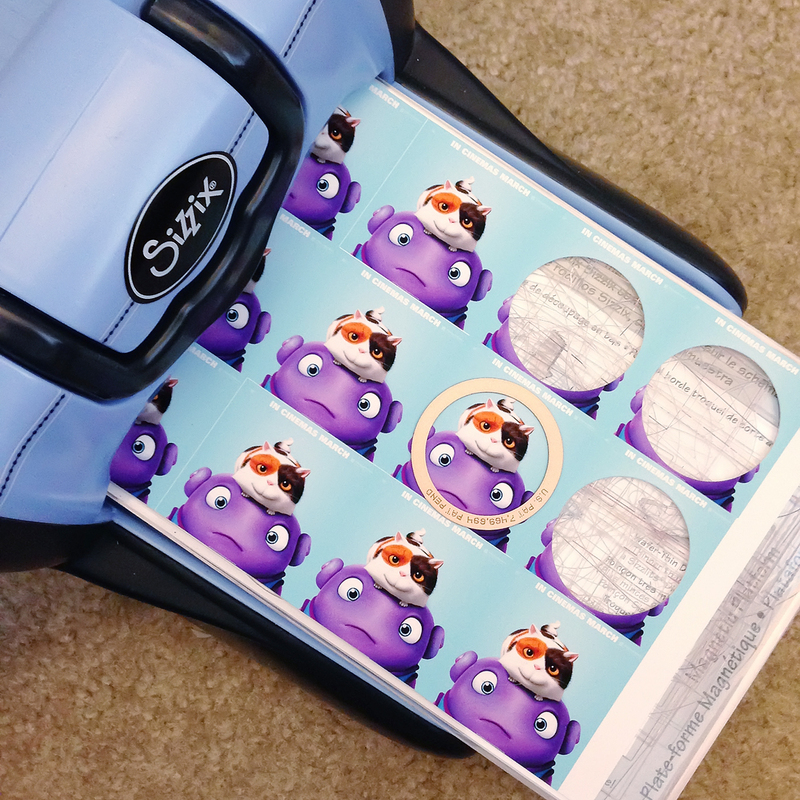 I will be sharing 2 cards featuring Simon Says Stamp Best Mom Ever stamp set (This post is not sponsored.). 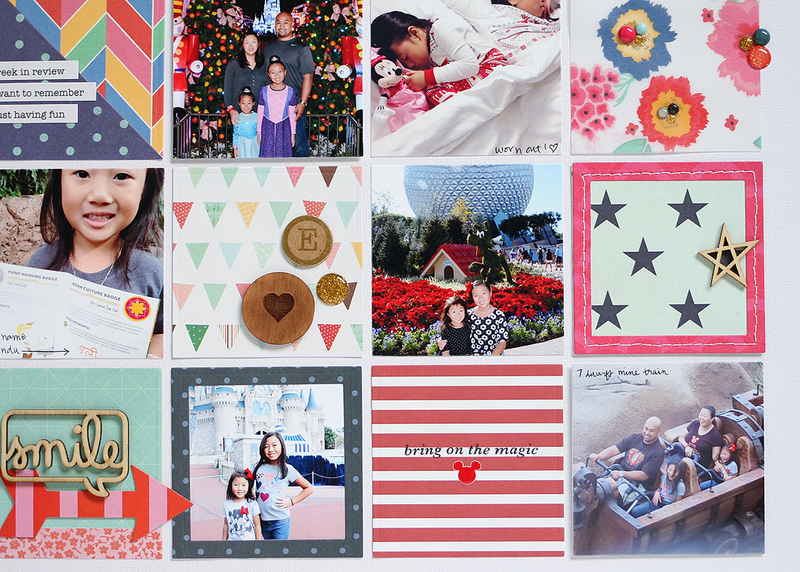 This stamp set is perfect for cards for your girl friends, your daughters, and of course, your mom. 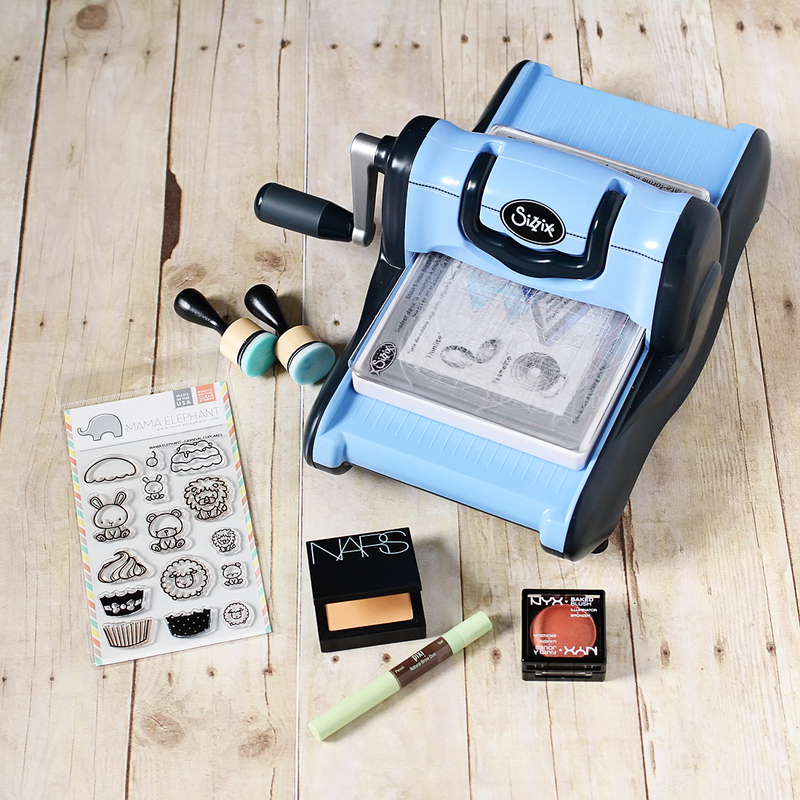 Mother’s day is right around the corner, and this stamp set is perfect! 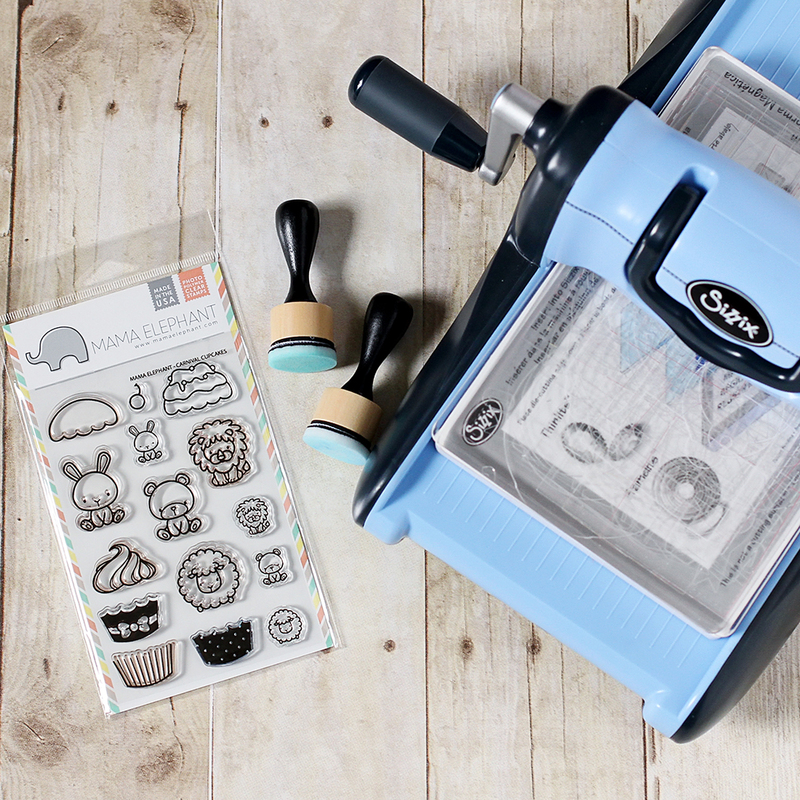 Not only can you use this stamp set for Mother’s Day, but I think it would be perfect for any occasion, like birthdays, good luck, happy anniversary, etc. This is just a general “Love you to the stars and back” card. With a different sentiment on the inside, it can be for anyone, for any occasion. 1. I stamped some roses and leaves with Memento tuxedo black ink on Neenah white card stock. I colored in the roses and leaves with copic markers and my wink of stella pen. 2. I cut the images, being really careful around the stems and leaves. 3. I played around with the flowers until I had it positioned just the way I wanted it. I glued down the tallest rose, and a single leaf to the background paper (which I had already cut down to size). The next flower to the left, i adhered with some low dimensional foam tape. 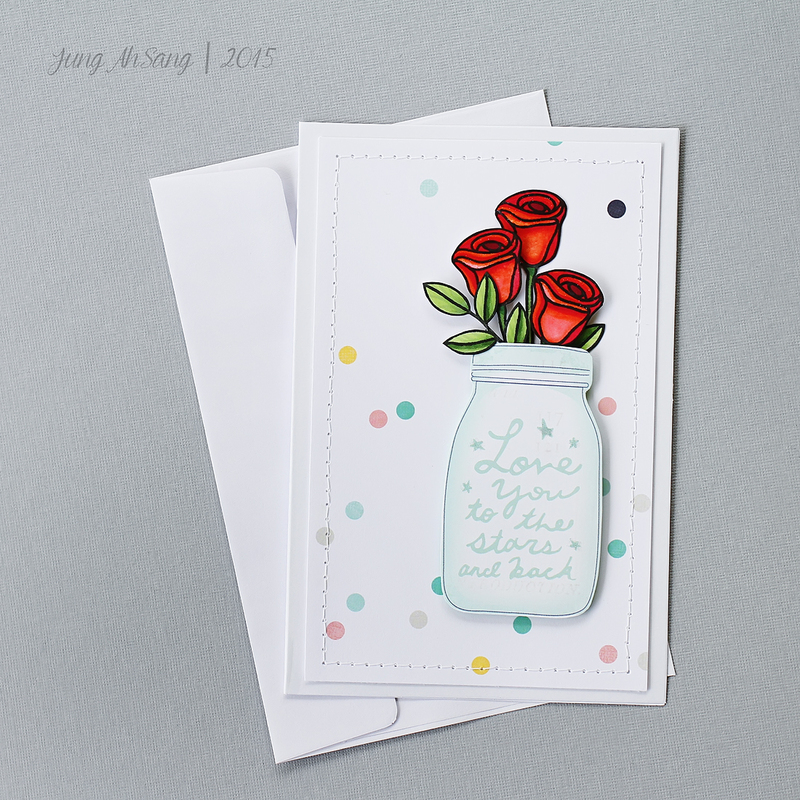 I adhered the last rose and the stem with leaves to the back of the mason jar. 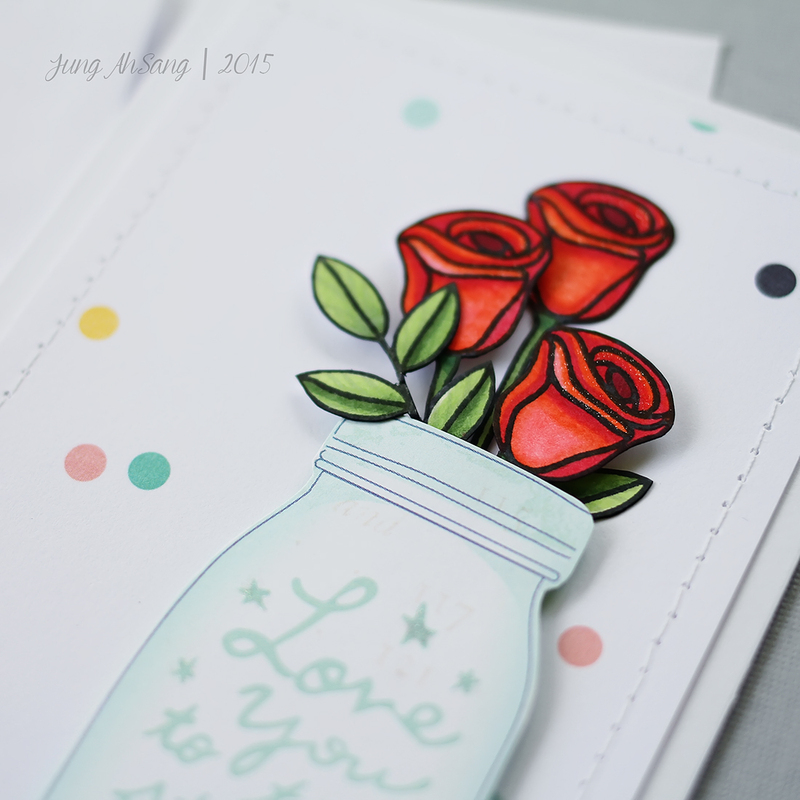 The mason jar is from a Dear Lizzy patterned paper that I cut out (one of my favorite papers ever!). 4. I adhered the mason jar with the rose and leaves using some thick foam adhesive so it would stick up a little higher than the 2nd rose. 5. I machine stitched a border around the confetti background paper. 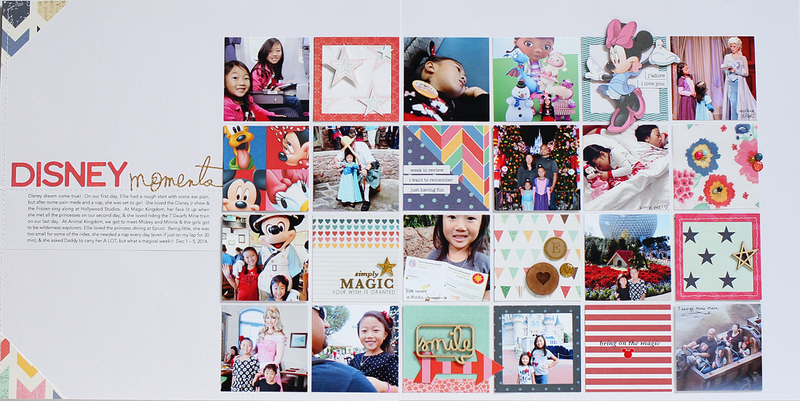 The background paper is from a paper pad by Heidi Swapp. 6. 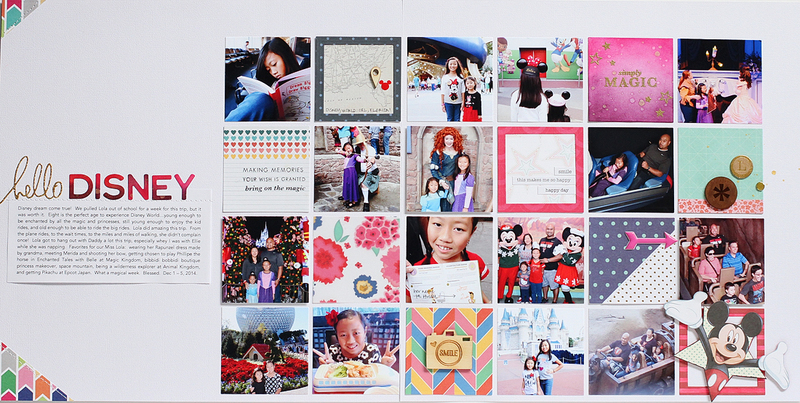 I adhered the background paper to the card base. Such a simple card, but I love the way it turned out! 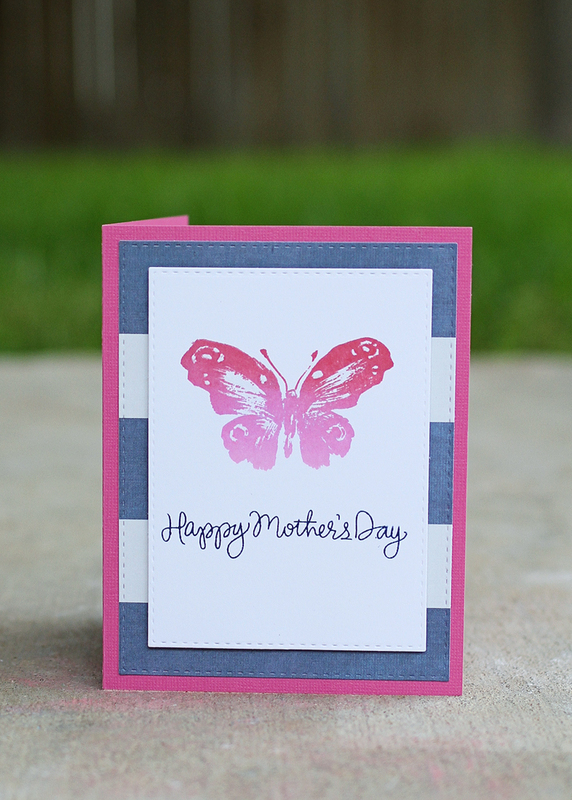 Another general card, you could send to anyone on any occasion using the right sentiment on the inside of the card. 1. I stamped the roses and leaves with clear versamark ink on Tim Holtz watercolor paper. 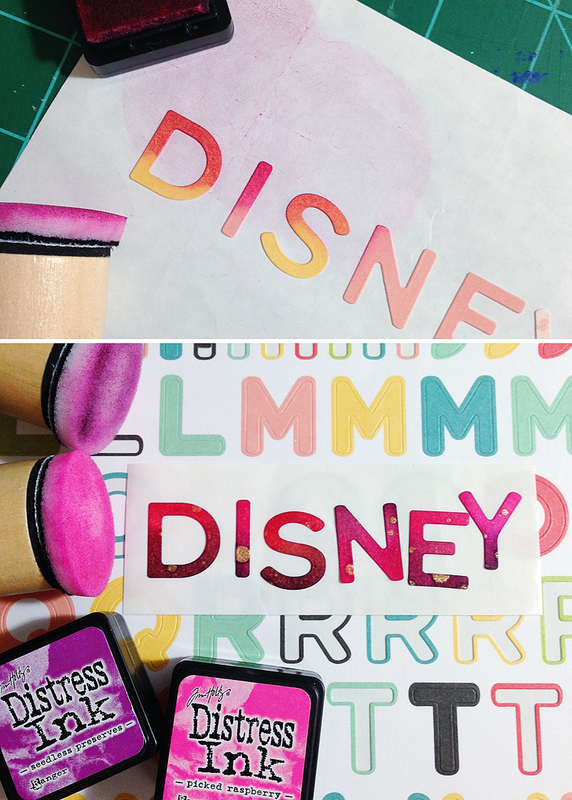 Then I sprinkled some WOW white embossing powder on the stamped image, and heat set the stamp. I watercolored the images using Tim Holtz distress inks in picked raspberry, spiced marmalade, mustard seed, and mowed lawn. 2. I heat set the images, and then cut out the roses and leaves. 3. I cut out the floral background paper to size. It’s by American Crafts that I found in the dollar section at Target. (Yep!) 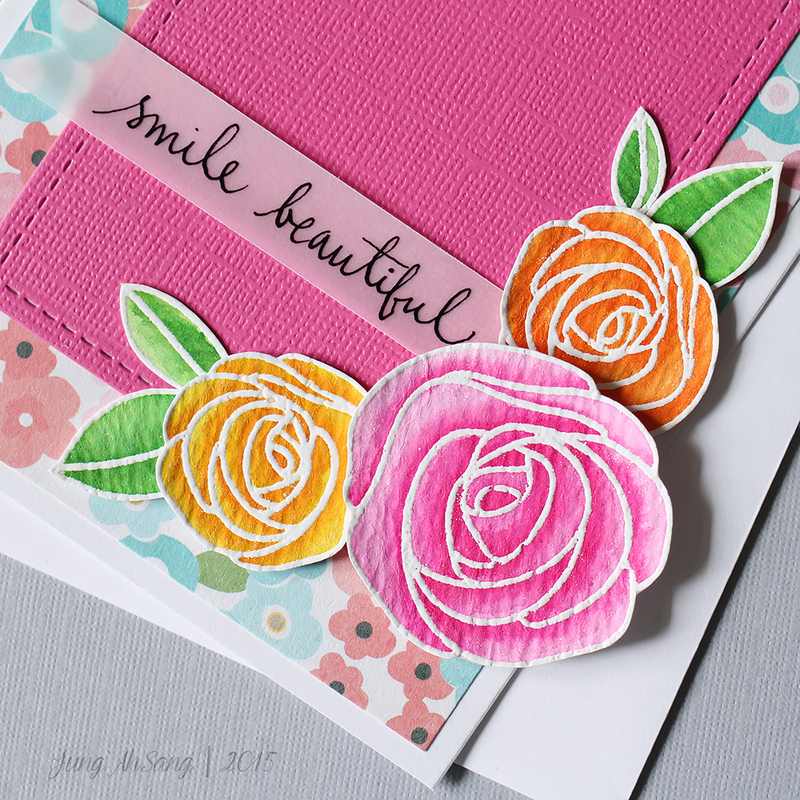 Then, I grabbed a piece of scrap pink card stock, and ran it through my sizzix using the stitched rectangle die from the Pretty Pink Posh stitched duo die set. 4. I hand wrote the sentiment out on vellum, and set it aside to dry. Once dry, I cut it down to size, an then cut a little notch on the left side, although it’s hard to see in the photo. 5. 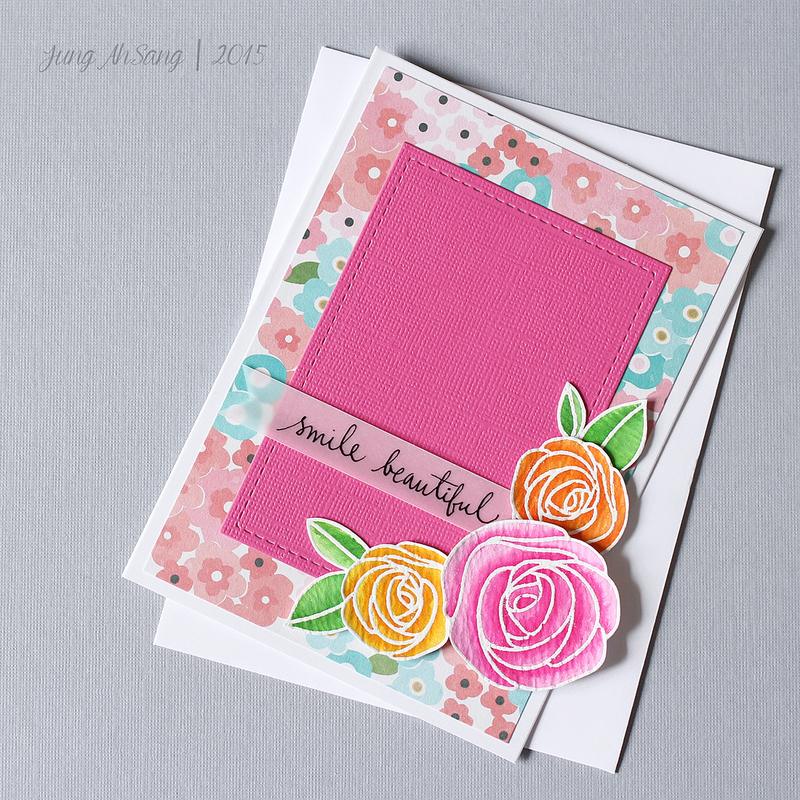 To assemble, I glued down the floral background paper to my card base. Next, I glued down the pink card stock. Then, I put a little glue on the vellum sentiment (just on the right side where I knew it would be hidden under the roses), and adhered it to the pink card stock. Next, I adhered the yellow rose, the orange rose, and the leaves using glue dots. Finally, I added the pink rose with foam adhesive. I love how these cards turned out. If you have any questions, just ask! I am still a newbie to card making, but I would be glad to help if I can! One of my favorite alpha stickers EVER is the October Afternoon thrift shop collection alpha sticker sheet (which is now discontinued). The font and size are perfect! However, the colors I had left didn’t really go with my layout. After toying with some other alphas, I kept coming back to the OA stickers, wondering how I could make it work. Since I had my supplies out from making the simply MAGIC square (seen above), I decided to try to ink the OA letters, and it worked like a charm! I stuck the letters I needed on some old sticker packaging, and took my ink blending tools, and inked over the letters. Then I splattered the letters with some gold mist for some extra oomph. 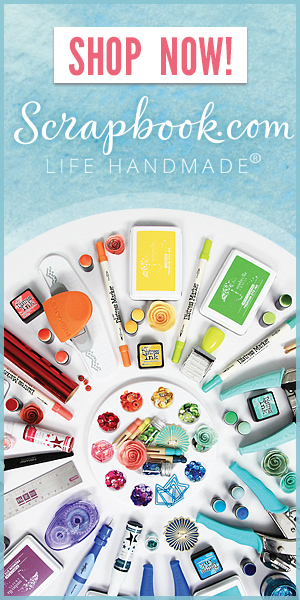 I’m not going to list my supplies this time, because I dug into my scraps, and there are a ton of different companies. Let me know if you have any questions though!